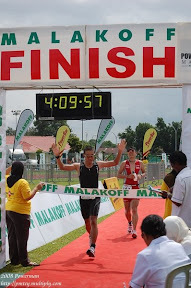 This is my 2nd time doing the 84km Ultramarathon. The first time was in 2008 and my time was 14:15:55 hours. Last year I did registered for the event but 1 month before the event, I’ve decided to cancel my participation due to lack of training. I know it is very X10 painful to complete the 84km run, so better not try it if you’re not ready. This year also I’ve registered early – around December 2009 and I have plenty of time to train but I didn’t train properly for it. I was too busy with my cycling that I neglect my running. The longest run I did was the Borneo Marathon 42km which was held 2nd May 2010 and this run I wasn’t really prepared for it. Two of my brothers are doing the half marathon 21km and if it wasn’t for them joining this event, I would have cancel it and do it some other time. We arrived in Singapore around 12pm and my race start at 6pm. Untuk membuang masa, w e visited 2 shops – 1 bicycle shop and 1 Garmin shop, after that we checked in to our hotel at Grand Mercure Roxy Hotel at East Coast. We went to the race venue around 5pm and the place was very huge/large. It is an airfield used by the Singapore to held Air shows. We went straight to the goodie bag collection tent since we have not collected our things yet. It was pretty much rushing since it is already 5:30pm and I’ve just collected my numbers. The organizer told us that for overseas participants, the goodie bag can only be collected at 5pm. This year there were around 500 runners (according to the bib numbers) trying to become an ULTRAMAN and more than a quarter will FAIL. The race started exactly at 6pm and I ran 1 Mile (1.61km) and walked 1 to 2 minutes, the same strategy that I used in Borneo Marathon. I don’t want to run like those peoples and stop when you feel tired and pain. I ran, I walk, I ran I walk, I ran I walk, water checkpoints, toilets checkpoints and I ran I walk again. Between 0km to 42km, I ate 1 sausage bun (mum’s bakery), 2 Powerbar Gel – Tangerine 2X caffeine, 1 EFS power shot liquid and 2 bananas. I was hungry and low in energy. During the Borneo Marathon, I only ate 1 banana and 3 Powerbar Gel Tangerine. The turning point is after the 21km mark and I’ve already decided to give up once I reached the 42km mark which is back the starting point. I didn’t tell any runners that I’m giving up because I don’t want them to motivate and encourage me to continue and I don’t want them to be de-motivated because of it and forces them to give up also. It was a good choice for me to stop at the 42km mark rather than stopping at other markers – 46km, 50km, 60, 70 checkpoints – Why good choice? IF I stopped at that checkpoints, as long as you are not ‘pengsan’, they – the volunteers and the medic will give you low priority and will only sent you back to the race venue after 6am. For sure you tidur lah at that checkpoint waiting to be pick up at 6am. Crazy punya policy. I reached the 42km mark around midnight, took my bag at the Ultramarathon checkpoint tent and saw many runners resting. Some are massaging their tired sore feets, others changing their attires and others sitting down cursing quietly why are they doing this. I sat down on the chair, took 2 bottles of water and wash my feet and massage it at the same time. That feels good. At one point I was thinking I should continue the race. I’ve done it before and I survive it. But after a while looking at the tired faces of the runners, naaahhhh, there will always be next year. I’ve managed to find my brother Aliuddin. He has just finished his half marathon 21km in a time of 2:59:18 hours. According to him, they ran an extra 7 to 8km because the road leading to the race venue was closed, they have to run to starting point. They were 16 minutes late – the race started at 9pm. They were lucky, some runners started at 10pm. Many more were stranded. The shuttle bus was also lousy and many were stranded at the bus stops. Even those doing the full marathon 42km, the race started around 12am midnight, some started running around 1am. Getting to the race venue is one thing but getting back to the hotel is another BIG problem. The race venue is very far from ‘civilization’, so no taxi is coming in and it is midnight. The only hope is to wait for taxi coming in dropping its customers or call the taxi. At first, we just waited for taxi to come in, but only a few come in and the people queuing up for taxi was very long. At last I call a taxi company – which took around 1 hour of dialing numerous taxi cab until they responded to my request and I’m using my Brunei numbers to call Singapore taxi cab. 2 and a half hours of waiting, finally we got a taxi and headed back to our hotel. We reached around 3:30am, slept around 4:30am and woke up around 7am for a flight back to Brunei around 12noon. For sure I’ll be back again……maybe next year or 2 to 3 years from now. Hopefully the organizer will improve its logistics and transportation. The race route has improved compared to previous years. A very flat and long route. Mentally challenged.